Ian is a recent transplant to Kodiak but has appreciated mountains, rivers, oceans, forests, wind, rain, snow and tough, individualistic people and animals his whole life. He believes that wild places are an essential part of our world that deserve special attention and that we all have a right to access and duty to protect them, which are both key endeavors of Island Trails Network. When he’s not flying helicopters for the Coast Guard, he tries to be hiking/backpacking, telemark skiing, surfing or kayaking. He and his wife Stephanie have three other family members who also love Kodiak: two small twins and one large German shepherd. Lisa grew up in Kodiak and recently returned home with her husband Jason, daughter Isla, and dog Shumagin. She works for the Alaska Department of Fish and Game as the Assistant Area Management Biologist for the Alaska Peninsula and Aleutian Islands and holds a BS in Biology from UAF and a MS in Fisheries from the University of Washington. She spends her summers in Cold Bay and winters in Kodiak. Lisa enjoys hiking, running, hunting, fishing, boating, scuba diving, four-wheeling, skiing, and kayaking and is currently learning how to do all these things with a toddler on her back (except scuba diving). She loves travelling around remote places in Alaska as well as the rest of the US and world, but Kodiak is her favorite place to be. 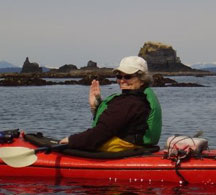 Linda arrived in Kodiak in 1980 to work for the Kodiak Island Borough developing the Borough's coastal management program. Prior to that she worked in recreation planning in British Columbia and neighborhood planning in Oregon. Linda is a lifelong outdoor enthusiast, starting her outdoor adventures as a Brownie Girl Scout. Past exploits have included scuba diving, downhill skiing, white water kayaking and rock climbing. 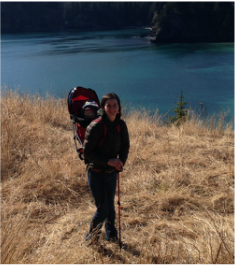 After acquiring a husband, children and pets in Kodiak she now pursues tamer outdoor activities, mostly hiking. Linda believes that it's important to give back one's community and volunteers with a number of organizations, including a stint on the ITN finance committee. Ben arrived on the ferry in 1994 with his then-girlfriend Karen. Within a little while they were married with kids and a house and no desire to live anywhere else. He enjoys mountain biking, trail running, hiking, kayaking, and skiing. Ben and Karen raised two kids and a brewery here and don't have any plans to leave. Ben believes trail use has increased with the change in demographics over time. Kodiak is a tough place to get to, and to get around. That helps keep it wild and wonderful, but still not immune to the impact of increased back country use. Ben hopes to increase recreation opportunities as well as minimize degradation through planning, design and maintenance. 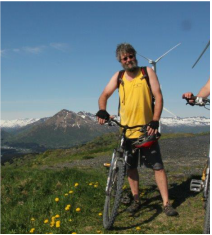 Howard was born and raised in Kodiak is an avid hiker and trail runner. He has assisted ITN with aerial interpretation of trail conditions using his drone. Howard is a shareholder and employee of Afognak Native Corporation.